This time of year I always reflect on things I am thankful for. Let's get the obvious ones out of the way. Family, friends, healthy, living in New York. Of course I am thankful and grateful for all of those blessings. But I want to focus on the smaller, less obvious things. Hopefully some of these will be things you can be thankful for as well. A few years ago I walked in to a Birdbath Bakery, one of City Bakery's small outposts. I was contemplating an iced tea (best in the city) or a cookie when something caught my eye. It was a stack of delicious croissants, but something was just a little bit different. They has sesame seeds on them. Then I saw the words "pretzel croissant" and my head exploded. I bought one. I tasted it. I was Homer Simpson, drooling and muttering things like "butter", "salty", "so good", "aaaggghhhhhhllllllll", etc. Imagine this: the best, flakiest croissant you have ever eaten meets a delicious, perfect German soft pretzel while at Octoberfest in Munich. One thing leads to another and the result is this heavenly, hearty, savory and salty crescent shaped gem. 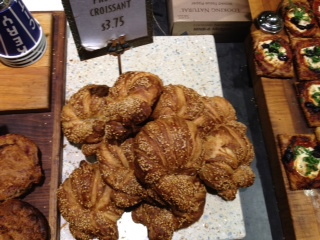 Eating a pretzel croissant will restore your faith in humanity and sooth your weary soul. Seriously. Just go get one. Now. You will thank me. And pick one up for me while you are at it.